One thing I did think about at some point was that sometimes, the bag can be “hard” to carry. 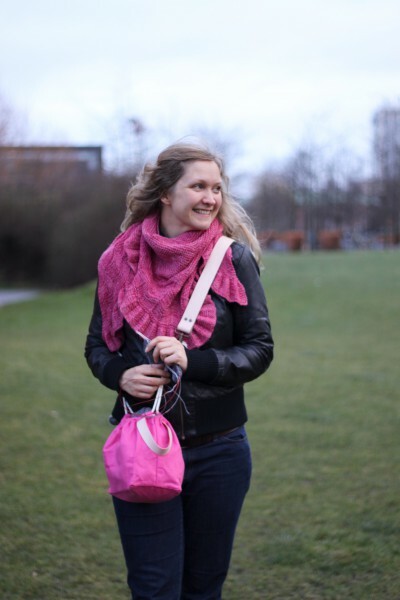 Let’s say you’re at a knitting/yarn festival, you have your project in your Fringe bag, and you want to be able to have your hands free to grab yarn. The leather wrist strap / handle on the bag is nice, but it’s not very yarn fondle friendly, is it? 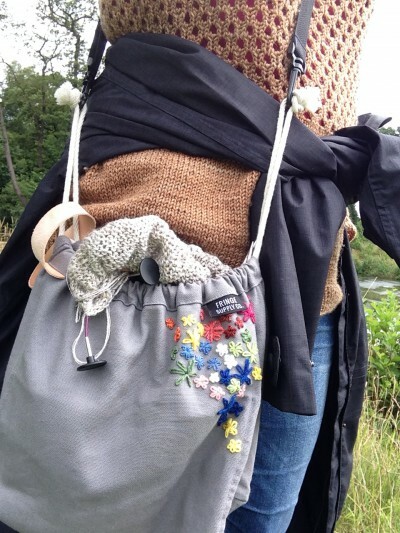 This summer, while I was on a natural yarn dyeing workshop, we went for a walk to collect dyeing materials. Walks can be boring ;) And being with almost all knitters, I was thinking no one would be bothered by me knitting my very boring project while walking. Queue temporary solution for a shoulder strap! Ever since, I have been thinking of that strap. I really want something prettier, more comfortable, and complementing that pretty bag better. Receiving my 3rd (!) Fringe bag in the post, I impulsively decided to do something about it. Can’t be that hard, right?? 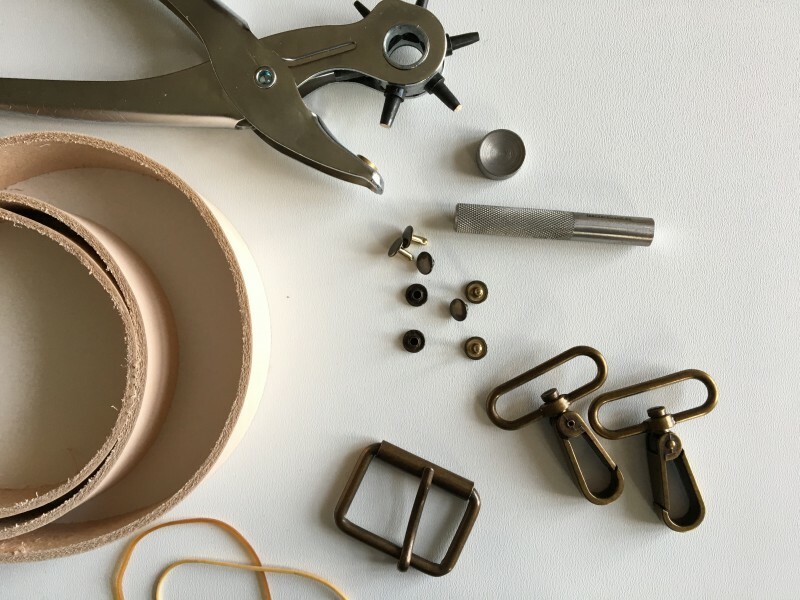 I went to a local leather ware shop in downtown Copenhagen (Skindhuset – that place always inspires, makes me want ALL THE THINGS, and really wants me to pursue new hobbies like leather working…). As I suspected (I didn’t really do that much research before I went), they really had everything I needed. 2 carabines. Cost: DKK 15 each, DKK 30 in total. 1 simple belt buckle. 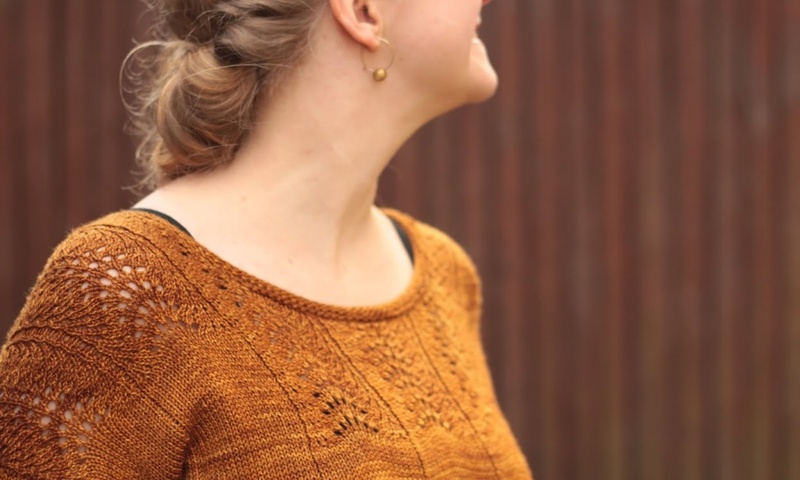 Cost: DKK 8.
studs (and tools to handle them) – I took the studs that are rounded on both sides, to make it all look prettier. Cost: Studs DKK 60.
a leather punch tool (what’s the exact English word for that?) – I needed one anyway! Step 1: Punch two holes next to each other at each end of the strap. 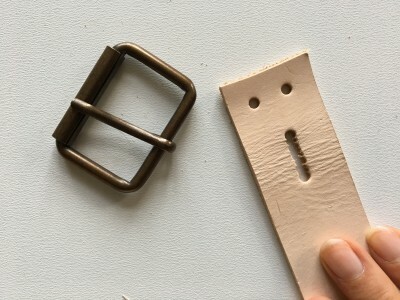 Punch a line of overlapping holes at one end – these are for accommodating the buckle. This end will be where we attach the buckle. 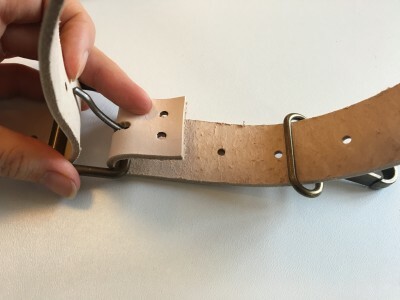 Step 2: To check whether that center line is long enough, and also where to punch additional holes for fixing the strap around the buckle, double the strap around it. Make sure the center pin/thingy of the buckle can move freely. To match the second set of holes to the first, mark in the middle of the existing holes with a pen. And then of course, punch them! Also punch corresponding holes at the other end (using the same method, just folding it around one of the carabines instead). Step 3: Punch holes for the buckle! 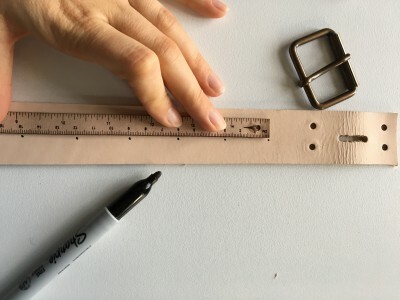 I punched a hole every 3 cm / 1.25 inches along the center of the strap. You can add as many or few as you like, it’s always possible to punch more! Step 4: Assembly! This is where you need to keep your tongue straight in the mouth, as we like to say in Denmark. This needs to be done in the right order and the right way around. 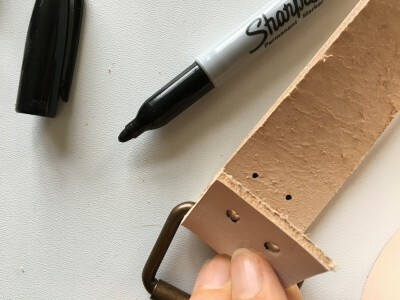 First, bring the strap through the buckle, the front of the (open!) 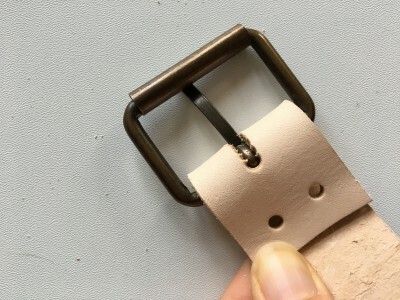 buckle facing on the right facing side of the strap. 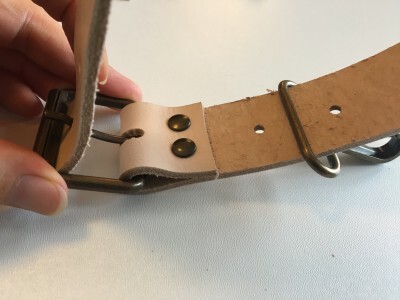 On the photo, the end of the strap is to the right in the picture, so the pin on the buckle (buckle folded completely open) is pointing to the right as well. 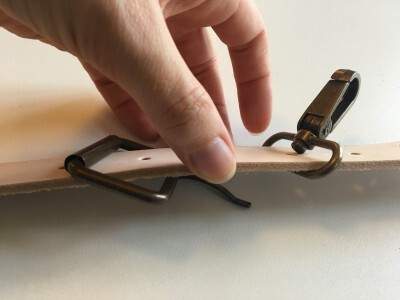 Second, bring the strap through the carabiner, the clasp facing upward (on the right facing side of the strap). Third, double back the end of the strap and stick it through the buckle again from the left, wrapping it around the part of the buckle where the pin is, and sticking the pin through the opening made for it. Step 5: Make sure it sticks! Now add the studs, bringing them through the holes in both layers and fastening them with a hammer. I got a nifty little tool for that, so I didn’t accidentally smash the studs to non-prettiness. Fasten the other carabiner to the other end of the strap in the same way. And voilá! You’ve got a shoulder strap! 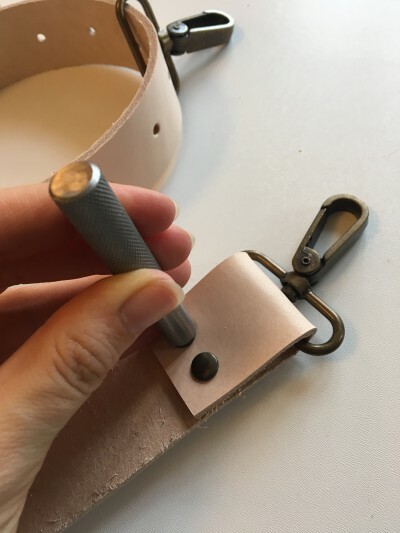 On my initial prototype, I didn’t add a thingy that keeps the double straps between buckle and carabiner together (I don’t know the word for that in English at all, bear with me here!). So what I did was add a rubber band around them, which works fine but isn’t as pretty as it could be. 1. Bring strap through buckle (step 4, first). 2. Bring strap through together-keeping-thingy. 3. Bring strap through carabiner (step 4, second). 4. Double strap under and bring it back through together-keepin-thingy. 5. 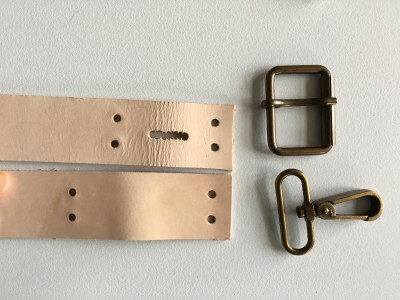 Bring strap through buckle (step 4, third). It’s a bit of extra wrapping-your-head-around, but once you get the picture it’s all easy.